COPD has a number of diagnostic challenges. Here, the authors consider the process and look at the issues GPs might face. The onset of symptoms is insidious and on reflection, patients may have been symptomatic for many years before diagnosis. Examination of past records often shows previous episodes of “winter bronchitis” or chest infections. There is usually a steady decline in symptoms over time as lung function worsens. Breathlessness is usually the major symptom and tends to be persistent and progressive. It may be associated with wheeze or chest tightness. Cough may initially be intermittent or just associated with exacerbations and may variably be associated with sputum production. Although COPD symptoms are typically persistent, they may be punctuated by acute exacerbations where symptoms temporarily worsen and then recover, although not always back to baseline levels.12 Physical examination signs may be few and far between in early disease although complications and extrapulmonary manifestations, such as muscle wasting may occur early. Red flag symptoms may indicate severe disease, complications or another underlying disease. These should prompt urgent investigation and referral as necessary. Haemoptysis may occur during respiratory infections, however COPD patients are at a higher risk of lung cancer and an urgent referral should be sought. Likewise marked weight loss or rapid decline may suggest an underlying malignancy and should be investigated. A list of symptoms requiring further consideration is listed in Table 1. Imaging NICE guidance recommends a chest radiograph following a diagnosis of COPD. 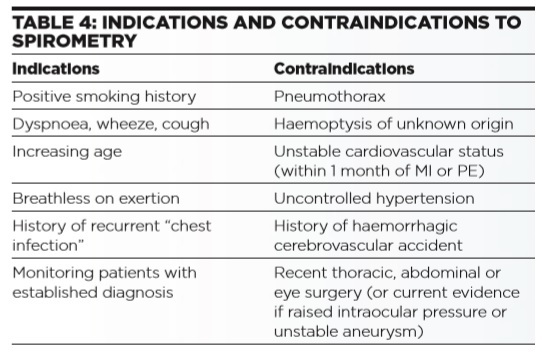 They aid little in the diagnosis of COPD but may detect other abnormalities which change treatment practice in 14% of cases.25 It is more useful where there is diagnostic uncertainty or suspicion of complications. However it is not sufficiently sensitive or specific to exclude other diagnoses and therefore referral to secondary care and consideration of computed tomography of the chest may be required. Pulmonary rehabilitation (PR) is an extremely successful intervention to improve exercise capacity, muscle strength and quality of life.31, 32, 33 It should thus be considered a key component of COPD management. PR should be locally available and tailored to the individual patient. The programme is designed to be progressive in nature, including both aerobic and resistive exercise accompanied by a structured educational programme. 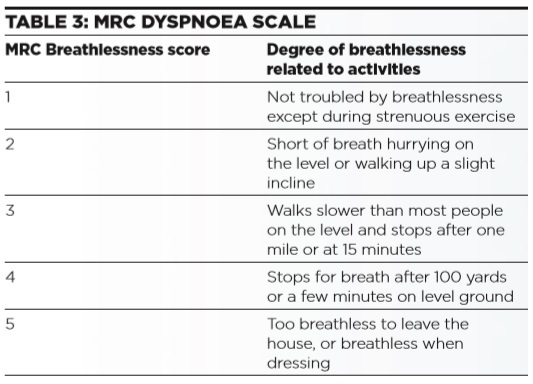 COPD patients with selfreported exercise limitation (MRC dyspnoea score 3-5) should be considered for enrolment, and those with a lesser degree of limitation (MRC dyspnoea score 2) but considered functionally limited may also gain significant benefit.34 Evidence also exists for the value of early pulmonary rehabilitation following hospitalisation for an acute exacerbation. PR programmes should be of a minimum duration of six weeks, and include a minimum of two supervised exercise sessions and one unsupervised but prescribed session weekly. Following completion of the course patients should be provided with an individual written plan to encourage ongoing maintenance.34 For patients showing evidence of loss of functional status, particularly if more than one year has elapsed from attendance, there is recognised value in considering repeat PR. Hypoxaemia is a frequent complication of COPD and oxygen therapy has been shown to confer a survival benefit in appropriately selected hypoxaemic patients when given for a minimum period of 15 hours per day.35 Assessment should include arterial or capillary blood gas sampling on at least two occasions, separated by a minimum of three weeks, and those with a PaO2 <7.3kPa (or <8kPa in the presence of nocturnal hypoxaemia, secondary polycythaemia, peripheral oedema or pulmonary hypertension) may qualify for the provision of long-term oxygen therapy.30 Patients may frequently demonstrate worsening hypoxaemia during an intercurrent exacerbation and thus should be formally assessed after at least five weeks of clinical stability to avoid inappropriate long-term prescribing. Ambulatory oxygen therapy refers to the provision of oxygen delivered when the patient is engaged in physical activity. This is clearly important for patients who require oxygen at rest. However, some patients who do not require long-term oxygen therapy may experience significant exertional desaturation (of the order greater than 4% drop in arterial saturation to ≤90%) that limits physical activity. This does not indicate a prerequisite for ambulatory oxygen therapy but patients demonstrating both improved exercise capacity and quality of life with oxygen usage following a formal assessment should engage in a discussion about its acceptance and usage.36 Pulmonary rehabilitation provides an ideal opportunity for this exchange. It is important to note that oxygen is not an effective therapy for dyspnoea in the absence of hypoxaemia, thus the use of short-term oxygen therapy should be discouraged in this case and more effective therapies pursued. Guidelines and referral criteria NICE guidance on COPD was updated in 2010.22 It provides a comprehensive overview of diagnosis and management of COPD. Patients with severe disease (FEV1 <50%), an uncertain diagnosis, atypical features or suspicion of complications and co-existing pathologies should be referred to secondary care for evaluation. In addition, those patients where the degree of breathlessness seems out of proportion to spirometric abnormalities or there are recurrent exacerbations should also be referred. 1 COPD is common and often undiagnosed. It should be considered in all adults presenting with chronic breathlessness, wheeze or cough. 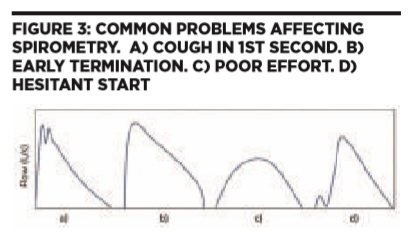 2 A combination of clinical history and good quality, postbronchodilator spirometry is needed to make a diagnosis. 3 Complications and co-morbidities are common in COPD and should be actively sought. 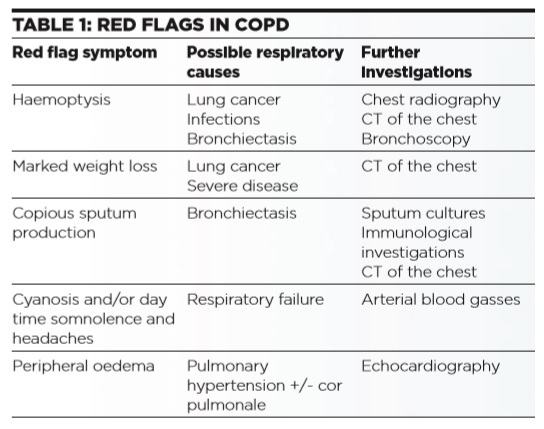 4 Referral to secondary care should be considered for patients with red ﬂags, atypical symptoms or those with an unclear diagnosis. A 59 year old man presents the surgery complaining of a cough productive of green sputum and breathlessness over the last week. It is noted he had two similar episodes last winter for which he received antibiotics. On further questioning he says he gets breathless climbing stairs or hills. He smokes 20 cigarettes per day and has done since he was 16. Clinical examination reveals mild wheeze and his oxygen saturations are 96%. He is treated with a one week course of oral prednisolone and doxycycline. He is bought back three weeks later when he has recovered and undergoes spirometry after 400mcg of inhaled salbutamol. This reveals an FEV1 of 1.93L (54% predicted) and a FVC of 4.2L (93% predicted) with a ratio of 45%. He is told he has moderate COPD and the importance of stopping smoking is discussed. He is prescribed salbutamol inhaler and a tiotropium and referred to a stop smoking service. This case is a straightforward diagnosis of COPD. Smoking cessation is the most important treatment to consider initially as it is the only one that can slow the rate of decline in his lung function. NICE guidance gives recommendations on treatment algorithms for COPD. A 68 year old woman who is an ex-smoker and has a long standing history of rheumatoid arthritis returns to the surgery with another chest infection. She has had four courses of antibiotics in the last four months which only temporarily improved her symptoms. She normally produces two-three tablespoons of light green phlegm most days and is breathless on exertion. During infections she feels unwell and has an increase in the volume of her sputum and it often changes colour to a darker green with blood stains. On examination she has bilateral crackles but no wheeze on auscultation of her chest. A sputum sample is sent to the laboratory which grows Pseudomonas aeruginosa. Her GP is suspicious of bronchiectasis and so refers her to her local hospital where a CT scan of her chest confirms the diagnosis. Immunological investigation is normal and it is felt that the bronchiectasis is related to her rheumatoid arthritis. She clears the pseudomonas with a two week course of ciprofloxacin. This case illustrates that patients with atypical symptoms, such as excessive sputum production may have an alternative diagnosis. Bronchiectasis is caused by a variety of lung infections including pneumonias, aspiration, tuberculosis and measles. It may be associated with chronic inflammatory conditions, such as rheumatoid arthritis and immune defects. Inhaled foreign bodies and congenital defects can also cause it. 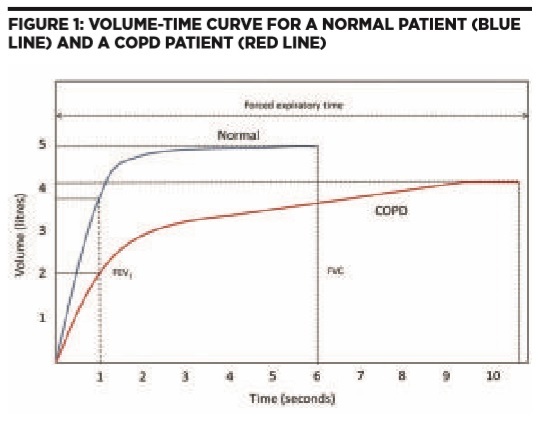 These patients require different management to COPD. 1. The burden of lung disease. 2nd Edition. British Thoracic Society; 2006. 2. Jordan RE, Lam KH, Cheng KK, Miller MR, Marsh JL, Ayres JG, et al. Thorax. 2010 Jun 1;65(6):492–8. Atkinson C, et al. The Lancet. 2013;381:997–1020. 7. Eisner MD, Anthonisen N, Coultas D, Kuenzli N, Perez-Padilla R, Postma D, et al. Am J Respir Crit Care Med. 2010 Sep;182(5):693–718. 8. Lokke A, Lange P, Scharling H, Fabricius P, Vestbo J. Thorax. 2006 Nov 1;61(11):935–9. 9. Marciniuk D, Hernandez P, Balter M, Bourbeau J, Chapman K, Ford G, et al. Alpha-1 Can Respir J J Can Thorac Soc. 2012;19(2):109–16. 10. American Thoracic Society/European Respiratory Society Statement: Standards for the Diagnosis and Management of Individuals with Alpha-1 Antitrypsin Deficiency. Am J Respir Crit Care Med. 2003 Oct;168(7):818–900. 11. Pauwels RA, Buist AS, Ma P, Jenkins CR, Hurd SS, GOLD Scientific Committee. Respir Care. 2001 Aug;46(8):798–825. 12. Rabe KF, Hurd S, Anzueto A, Barnes PJ, Buist SA, Calverley P, et al. Am J Respir Crit Care Med. 2007 Sep 15;176(6):532–55. 13. Guerra S. Curr Opin Pulm Med. 2005; 11:7–13. 14. Pasteur M, Bilton D, Hill A. Thorax. 2010;65(S1):i1–58. 15. Stage KB, Middelboe T, Stage TB, Sorensen CH. Int J Chron Obstruct Pulmon Dis. 2006 Sep;1(3):315–20. 16. Schols AMWJ, Soeters PB, Dingemans AMC, Mostert R, Frantzen PJ, Wouters EFM. Am Rev Respir Dis. 1993;147(5):1151–6. 17. Huiart L, Ernst P, Suissa S. CHEST J. 2005;128(4):2640–6. 18. Shujaat A, Minkin R, Eden E. Int J Chron Obstruct Pulmon Dis. 2007 Sep;2(3):273–82. 19. Budweiser S, Jorres RA, Pfeifer M. Int J Chron Obstruct Pulmon Dis. 2008 Dec;3(4):605–18. 20. Celli BR, Cote CG, Marin JM, Casanova C, Montes de Oca M, Mendez RA, et al. N Engl J Med. 2004;350(10):1005–12. 21. Roberts SD, Farber MO, Knox KS, Phillips GS, Bhatt NY, Mastronarde JG, et al. Chest. 2006 Jul;130(1):200–6. 22. 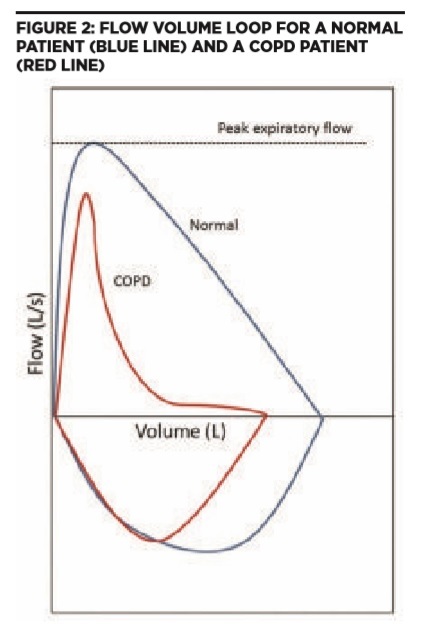 Chronic Obstructive Pulmonary Disease: Managment of chronic obstructive pulmonary disease in adults in primary and secondary care. National Institute for Health and Clinical Excellence; 2010. 23. Coates AL. Re: Coates AL, Graham BL, McFadden RG, McParland C, Provencher S, Road J. Can Respir J 2013;20:13-21. Can Respir J J Can Thorac Soc. 2013 Apr;20(2):122. 24. Miller MR. Eur Respir J. 2005 Aug 1;26(2):319–38. 25. Wallace GMF, Winter JH, Winter JE, Taylor A, Taylor TW, Cameron RC. Respir Med. 2009 Dec;103(12):1862–5. 26. Anthonisen NR, Connett JE, Kiley JP, Altose MD, Bailey WC, Buist AS, et al. JAMA J Am Med Assoc. 1994;272(19):1497–505. 27. Calverley PMA, Anderson JA, Celli B, Ferguson GT, Jenkins C, Jones PW, et al. N Engl J Med. 2007 Feb 22;356(8):775–89. 28. Tashkin DP, Celli B, Senn S, Burkhart D, Kesten S, Menjoge S, et al. N Engl J Med. 2008 Oct 9;359(15):1543–54. 29. Nannini LJ, Lasserson TJ, Poole P. Cochrane Database Syst Rev. 2012;9. 30. O’Reilly J, Jones MM, Parnham J, Lovibond K, Rudolf M, Guideline Development Group. BMJ. 2010;340:c3134. 31. Lacasse Y, Goldstein R, Lasserson TJ, Martin S. Cochrane Database of Systematic Reviews. Chichester, UK: John Wiley & Sons, Ltd; 2006. 32. Nici L, Donner C, Wouters E, Zuwallack R, Ambrosino N, Bourbeau J, et al. Am J Respir Crit Care Med. 2006 Jun 15;173(12):1390–413. 33. Dodd JW, Marns PL, Clark AL, Ingram KA, Fowler RP, Canavan JL, et al. COPD. 2012 Aug;9(4):390–4. 34. Bolton CE, Bevan-Smith EF, Blakey JD, Crowe P, Elkin SL, Garrod R, et al. Thorax. 2013 Sep;68 Suppl 2:ii1–30. 35. Cranston JM, Crockett AJ, Moss JR, Alpers JH. Cochrane Database Syst Rev. 2005;(4):CD001744. 36. Ameer F, Carson KV, Usmani ZA, Smith BJ. Cochrane Database Syst Rev. 2014;6:CD000238.